Pastry | Baking and Caking! 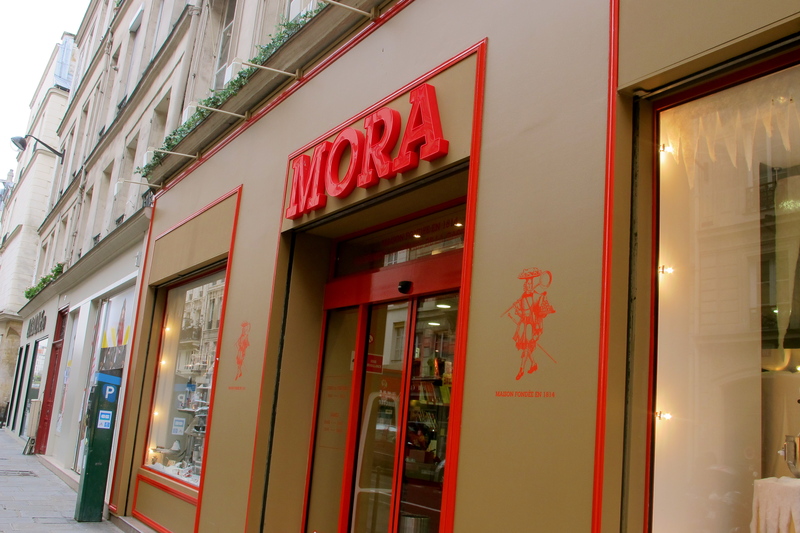 I’m realizing that in my pursuit to eat all the eclairs in Paris, I’m going to have a hard time writing about the shops that they come from because most patisseries here don’t have their own name. They just say Patisserie or Boulangerie out front. I guess I’ll just refer to the area from what it comes unless the store has its own name. Anyway, this was my first eclair since the best one at Stohrer (actually, it’s not my first since then, but the first one that’s been worth writing about. 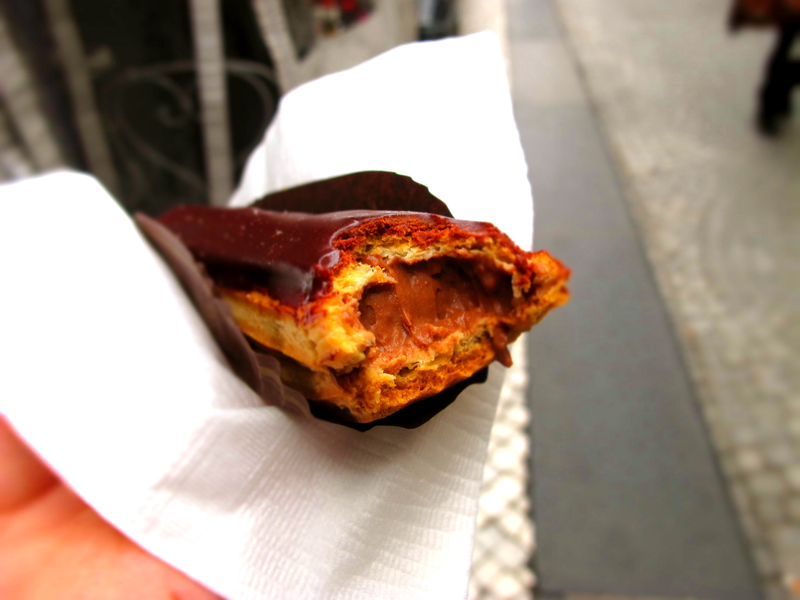 Even in Paris you can find a really bad eclair). 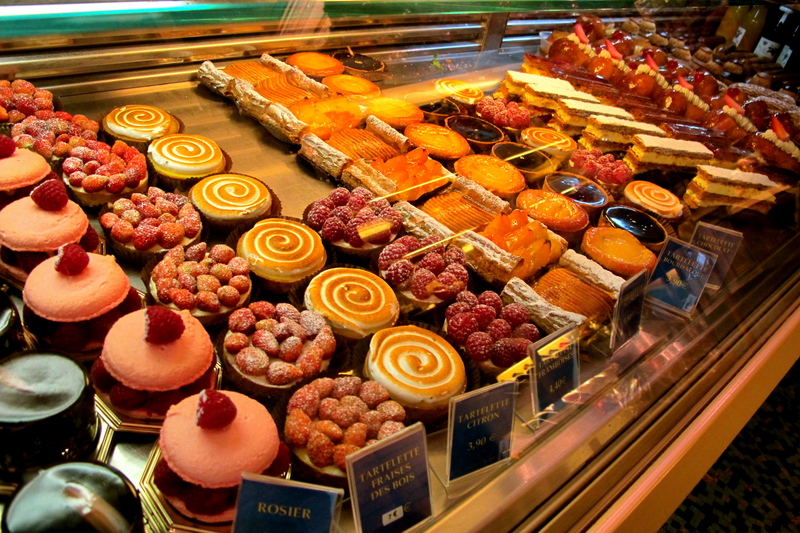 Right around the corner from me on Rue de La Roquette, is a very cute little patisserie that actually has an extensive display of pastries and breads for just being the corner bakery. I call it the Bastille eclair as you are stones throw away from the Bastille roundabout when you walk up to this patisserie. I’ve had some bread from here before, but never anything else. 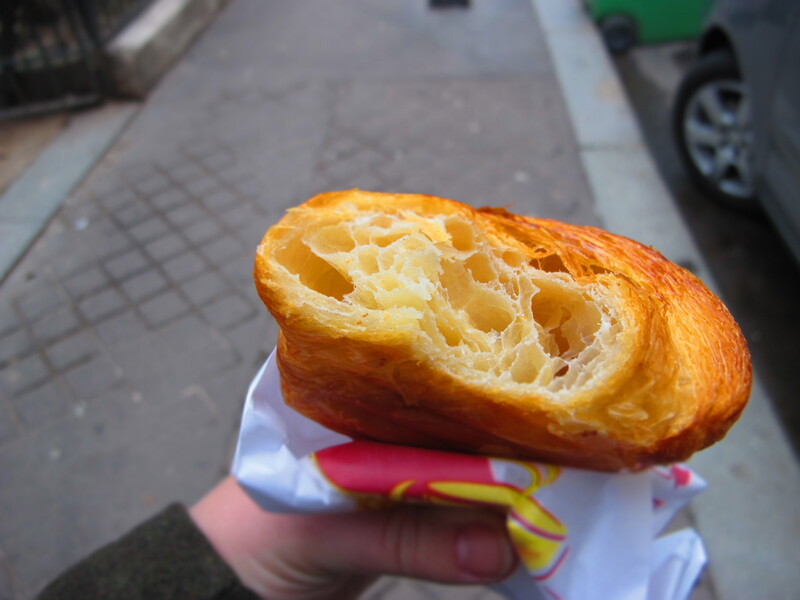 After buying some produce at the market the other morning, I went inside to grab a croissant for breakfast. Needless to say, I walked out with 2 croissants and an eclair, since it looked so delicious. Since I had yet to have breakfast, I restrained myself and waited until I got home and had my croissant and coffee before I decided to take a bite out of the eclair. 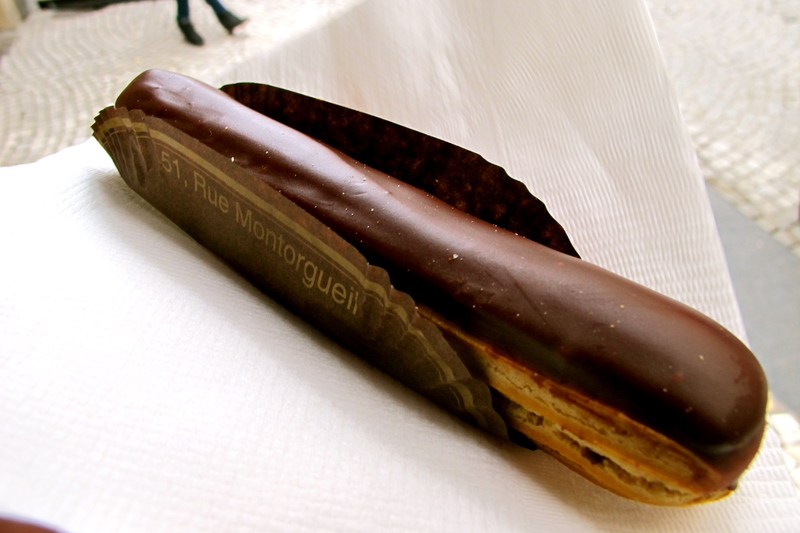 To start, it was definitely on the bigger side of eclairs that I have seen, making it all that much more alluring. I have to figure that getting anything this early in the morning means it has to be somewhat fresh, don’t you think? Right after my first bite, I knew that this was a decent eclair, but no where near the level of the Sthorer eclair, which all eclairs will now be compared to. While the pastry cream inside was good, although not quite as rich as I would have liked, the choux dough could not hold it’s own. Yes, I agree that the choux dough should be light, but this was just too light and flaky. As I’ve said, I had some bad eclairs here in Paris, so this definitely was not in the bad category, just not in the perfect category. Since this patisserie is just around the corner, I would certainly go back to grab another one, or maybe even try some of the other yummy things they had on display, but for now, I shall continue to sample more eclairs!!! 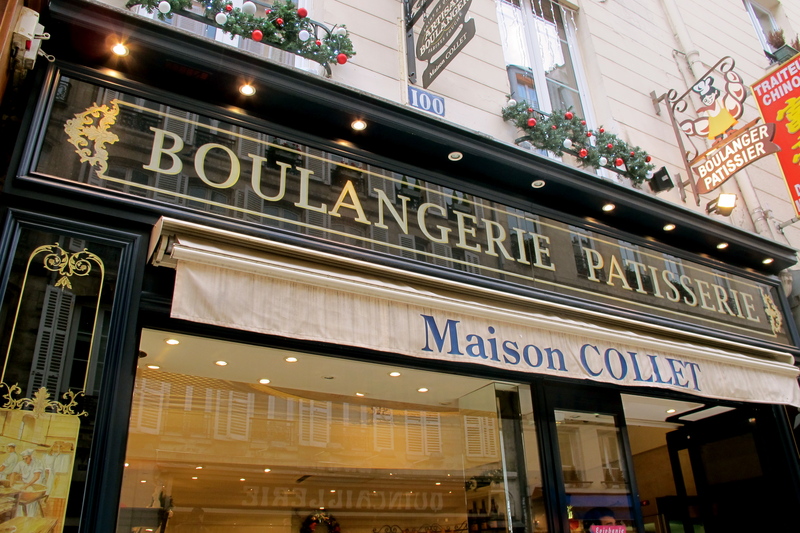 Living in Paris, one has the luxury of having a a boulangerie or patisserie on just about every block or street corner. In my few weeks here, I can honestly say that I think I have already eaten enough baguettes to last me a lifetime. For 1 euro, it’s such an easy snack or accompaniment to a meal at a very cheap price. While I have eaten myself through enough baguettes, the same cannot be said for croissants and pastries. 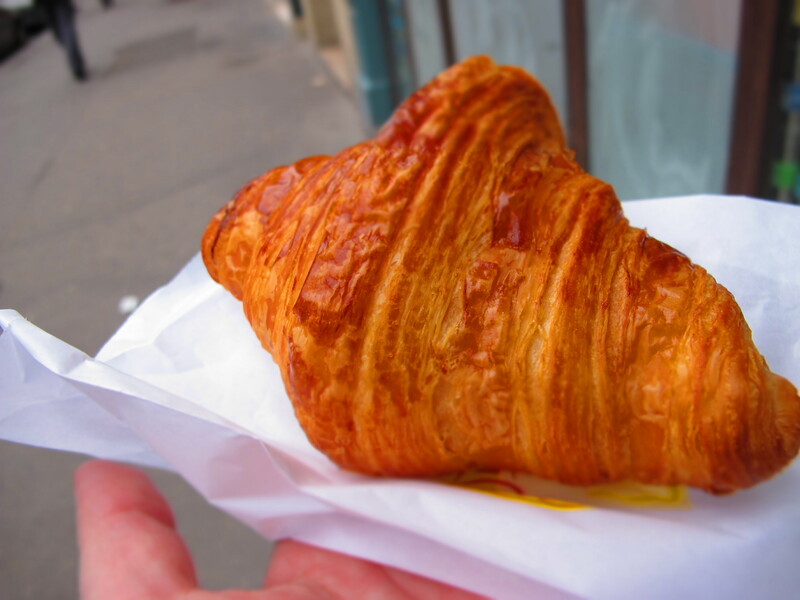 I have such a sweet tooth and a basic croissant au beurre is the perfect morning breakfast treat. 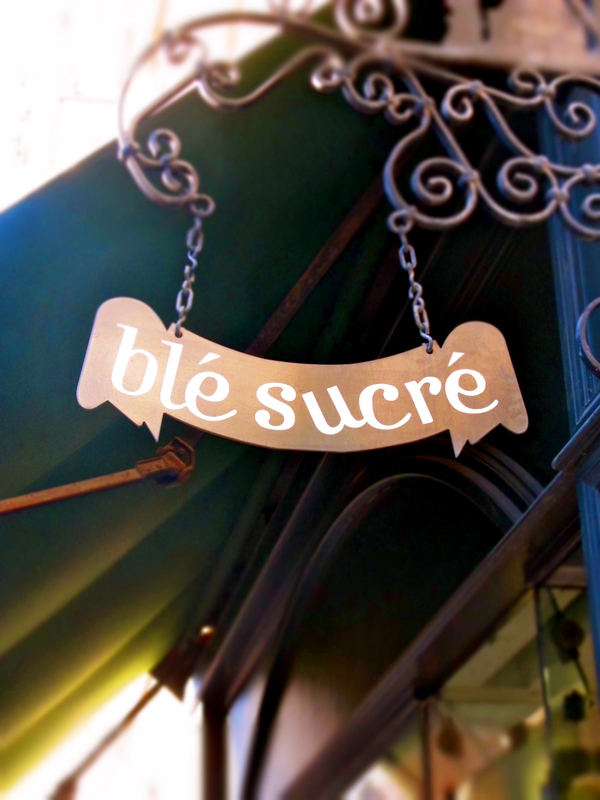 Luckily for me, there is a wonderful little patisserie right down the block from called blé sucré (translated to wheat sugar). In the 3 block walk to blé sucré, there are about 10 other places to stop and grab an coffee and pain au chocolat, but believe me, the extra few blocks to this little gem of a shop are well worth it. Their croissants are perfect. Just the right amount of flakiness and it peels apart into perfect strips. As I’ve sampled more and more croissants during my time here, you really do start to notice what separates the mediocre croissants from the epic ones. Mediocre ones tend to have a spongy texture and lacks the perfect flakey crust. The ones from blé sucré on the other hand earn top marks in all aspects of the perfect croissant. The other day, I decided to venture off the beaten path of my usual regular croissant and happened to grab this piece of amazingness. I really need to start doing that more often because you usually end up with something even better than what you went in for in the first place. I’m not even quite sure what it is, as I didn’t hear the woman when she mentioned the name, but let me just say, it’s wonderful. 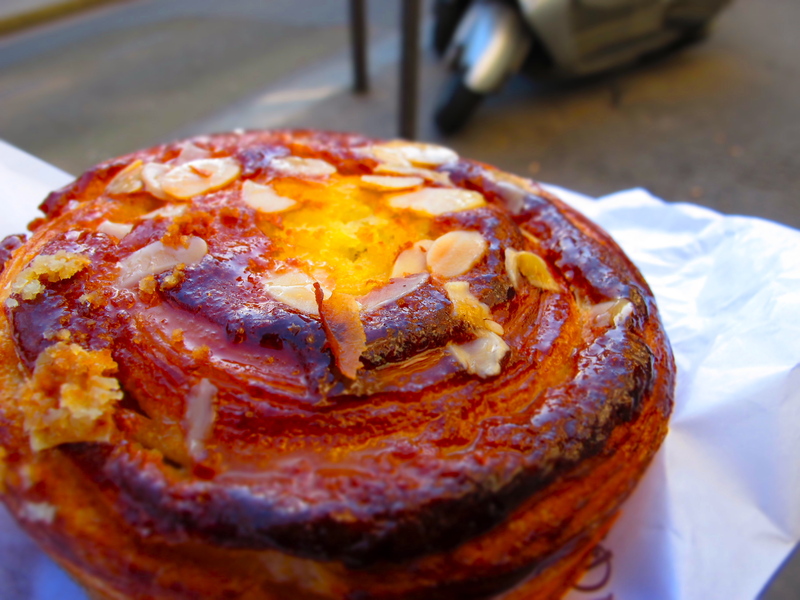 If you like almond croissants, cinnamon buns, or danish pastry, this one if for you. Similar to a cinnamon bun, but without quite the gooiness factor of one, this peeled apart in rounds and had a maple/sugary type glaze on top with some slivered almonds. It was so delicious and as usual, I couldn’t control myself from eating it far too quickly. Along with a cup of coffee and a glass of juice, this would definitely be the perfect breakfast treat. I’ve realized that I have not had enough eclairs in my life. I’m somehow never quite as drawn to the eclairs as I am to the cookies and cake, which I often gravitate towards whenever I’m at a bakery. 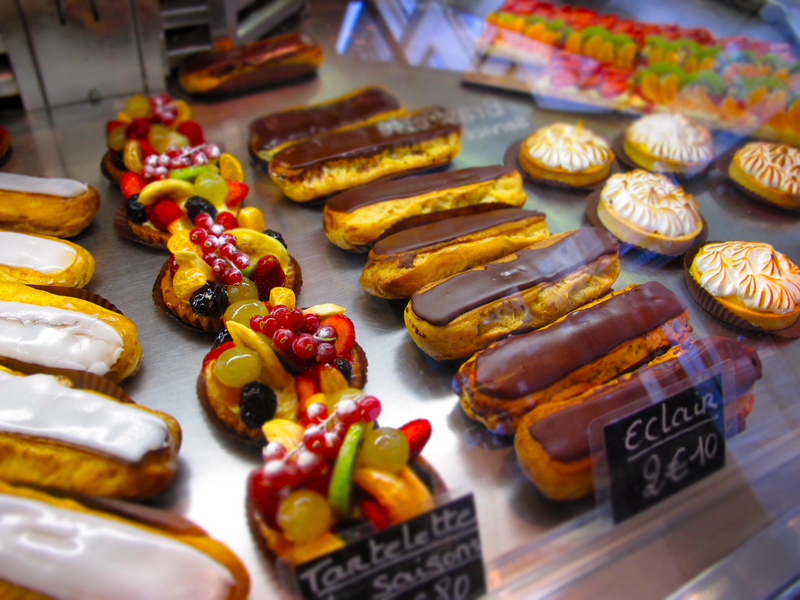 Now that I’m in Paris though and every patisserie has a healthy supply of eclairs, often in many different flavors, I’m finally realizing how much I’ve been missing out. 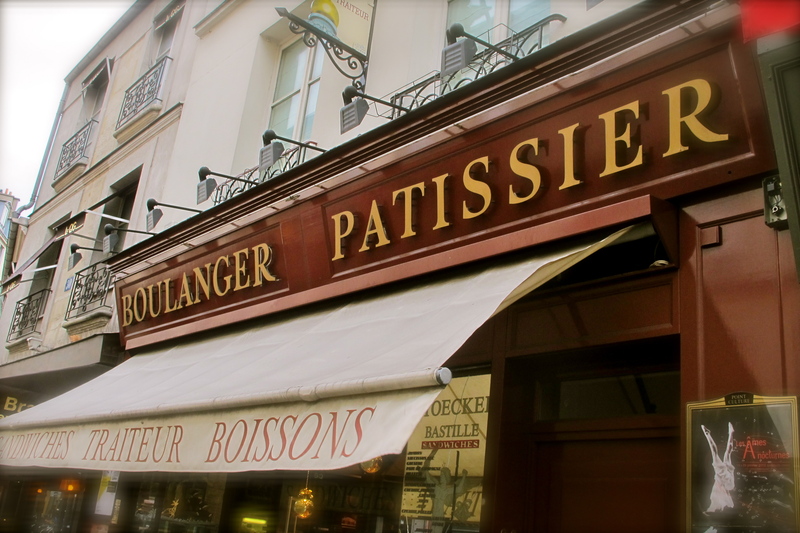 This realization stems from a recent visit I took to La Maison Stohrer, perhaps the oldest patisserie in all of Pars. 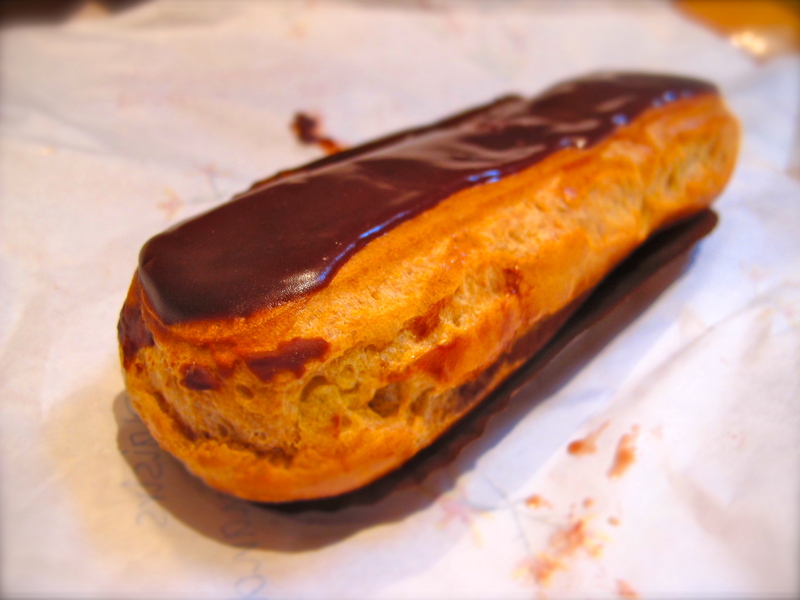 Not only are they the oldest, but they also claim to have the best eclair in all of France too. I was a little hesitant at first, given, as I said before, I don’t eat eclairs all that often, but after having one for myself, I think they deserve the title. Bitting into these sweet creations was heavenly. 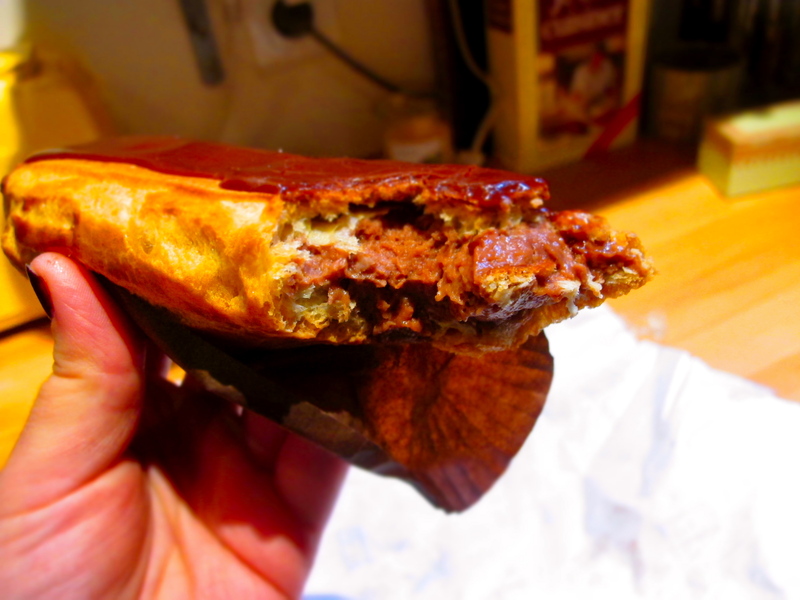 The chocolate pastry cream inside was perfectly chilled and light as mouse. This is seriously a delicious piece of pastry. It took all the effort I had not to eat it up in just a few bites. I was about to buy a second, but remembered that I really didn’t need to eat two in a row and I was out of money! 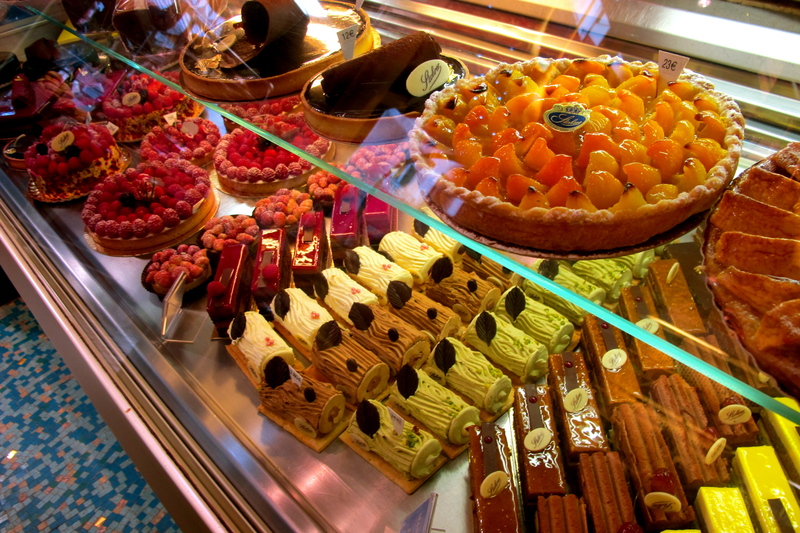 In addition to the eclairs, they have beautiful display of other pastries, chocolate and breads. Out front they had a special table selling extra galletes des roi, which are being sold at every bakery these days. I would definitely recommend La Maison Stohrer to anyone in Paris. 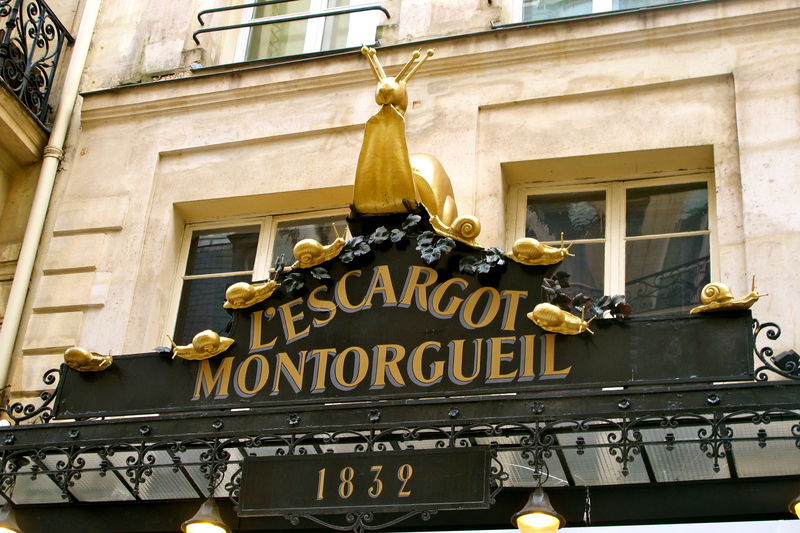 It’s on the wonderful Rue Montogrueil, which is worth a walk down anytime. 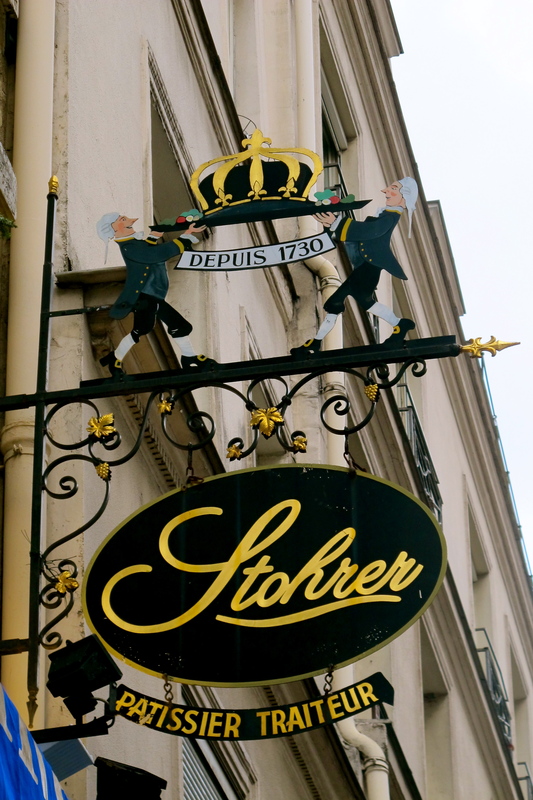 Now that I have discovered the pleasures of eating eclairs, I think I shall now try to sample eclairs for all different patisseries, to see if the one from Stohrer, is indeed the best eclair ever. 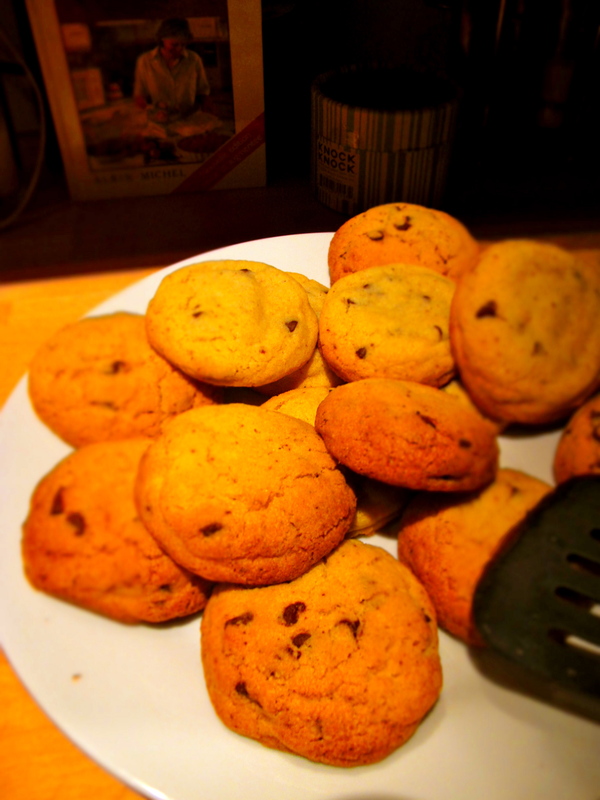 So I did finally manage to snag a pack of these chocolatey pieces the other day and decided, what better thing to make with them than chocolate chip cookies! Instead of the basic cookie, I decided to brown my butter. Something you should know about me is that I LOVE brown butter. Honestly, I think brown butter makes everything better. 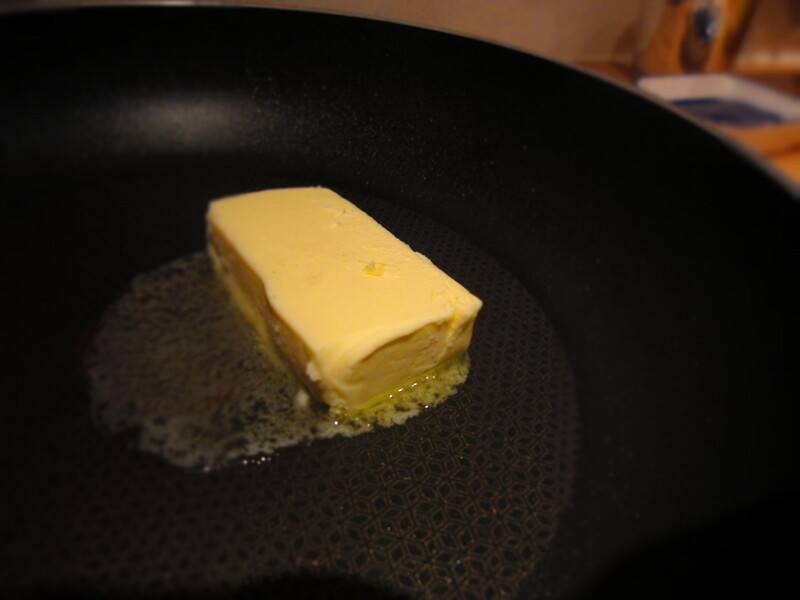 By heating up butter in a sauce pan, the liquids and the fats separate. As the fats start to toast at the bottom of the pan, it gives off the most amazing nutty smell, which corresponds to the nutty flavor it adds to baked goods. I also realized that since I don’t have a a mixer or my beloved KitchenAid with me, brown butter is much easier to blend with the sugars in the recipe if you don’t let it solidify again. Most recipes say the butter should be cooled completely before using, but I just let it cool to room temperature before I put it in with my other ingredients. I also was too impatient to let these cool for an hour in the fridge and was worried they might spread too much. I think the extra egg yolk acts as a glue though, so they stayed perfectly round, even when the dough was at a room temp. To brown butter, heat in a saucepan over medium heat until the butter begins to simmer. Continue cooking, stirring, just until butter begins to turn golden brown, about 4 to 5 minutes. Pour off into a measuring cup or bowl, leaving darkest sediment behind. Let the butter cool to room temperature. In a large mixing bowl with electric mixer, beat the browned butter and sugars until light and fluffy. Add egg and egg yolk, milk, and vanilla. Beat on low speed until well blended. In a separate bowl, combine the flour, baking soda, and salt. Gradually add the dry ingredients to the egg and butter mixture, mixing on low speed, until a soft dough forms. Scrape the bowl a few times. Stir in the chocolate chips. Cover and chill for about an hour. Heat the oven to 375°. 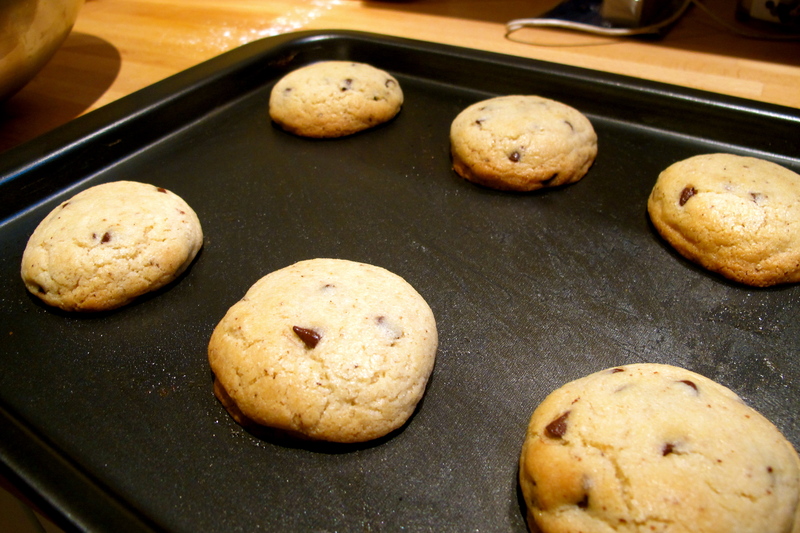 Line a cookie sheet with parchment paper or a silicone mat; spray paper with cooking spray. 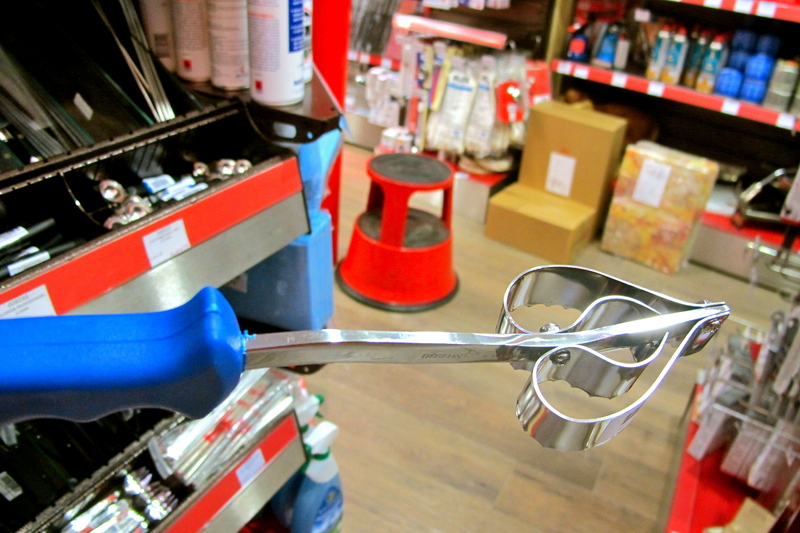 Using a cookie scoop, drop balls of dough onto the silicone mat or greased parchment, allowing about 2 to 3 inches in between the cookies. All good things must come to an end and after three solid weeks of wonderful French vacation, I actually have to start thinking about school related matters again. I guess this isn’t really a bad thing given that I’m actually somewhat looking forward to starting school again here in France, but I think the end of any vacation is always a little bitter sweet, especially after this amazing one that I’ve been having. Before I jumped back into the world of French classes, meeting new people and trying to write my resume in French in order to apply to some internships while I’m here, I took a walk down Rue Montorgueil, towards the center of town near Les Halles. (More on Les Halles later, but honestly, it’s just a big mall now – nothing of its former glory). 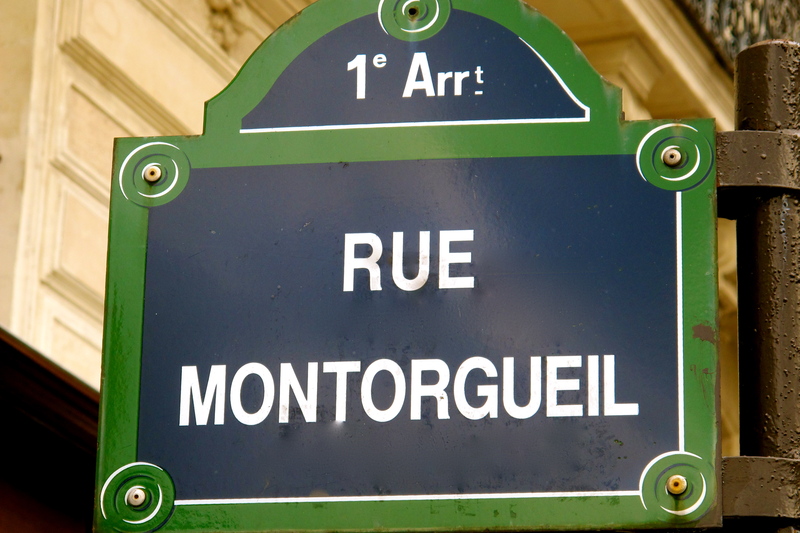 Now Rue Montorgueil, in my opinion, is certainly one of the more exciting streets in Paris. While cars are allowed to drive down, I don’t know why they ever would want to, as pedestrians take over this small cobblestone street in pursuit of delicious pastries or some famous escargot! This is the ideal place to go if you wanted to try a baguette, eat an eclair, buy some fish and cheese and grab a café while doing some serious people watching all at the same time. If you only had a quick layover in Paris, I think walking down this street would be a great way to get a little bit of all things French in one go-around. It gives a picture of how Paris manages to be resolutely modern while preserving a rich heritage. Some of the shops on this street have been around for over 200 years and there are countless signs outlining the significance of some of the historical sites. But of course, as I have come to find on many streets in Paris, a Starbucks sit right on the corner, for anyone who was thought they might be too far from home. 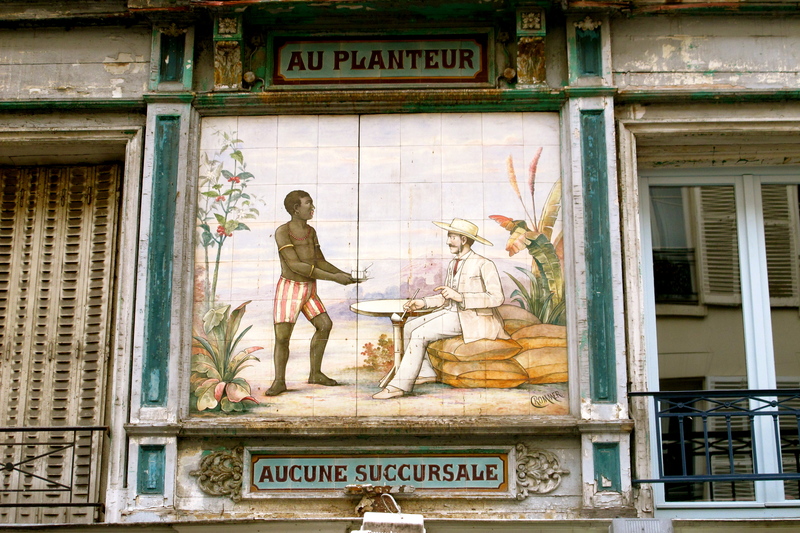 Some old fashioned street art: One of many boulangeries on the street: MORA – a pastry chefs heaven: In addition to the great patisseries and food shops, there are some of the most amazing kitchen supply shops around the corner from Rue Montorgueil. 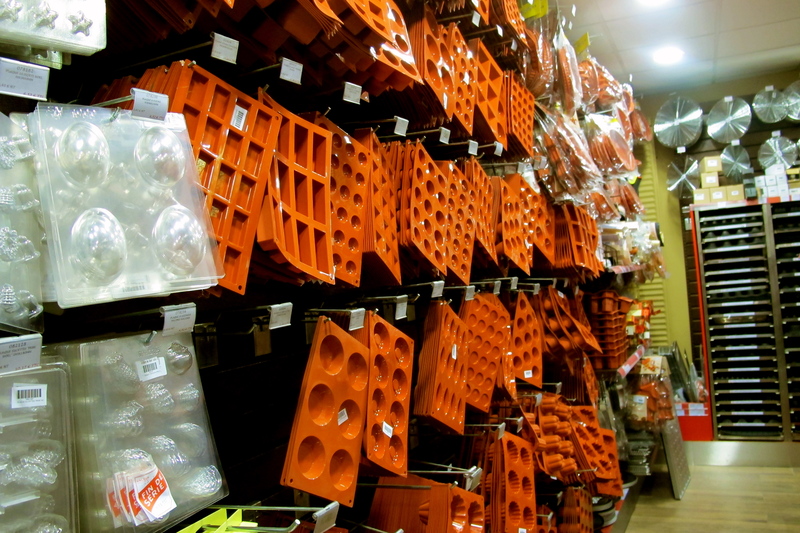 I am already planning my kitchen for when I have my own house someday, decked out with all professional grade stuff 😉 If you’ve ever been to the Zabars kitchen store in New York, it pails in comparison to these stores. 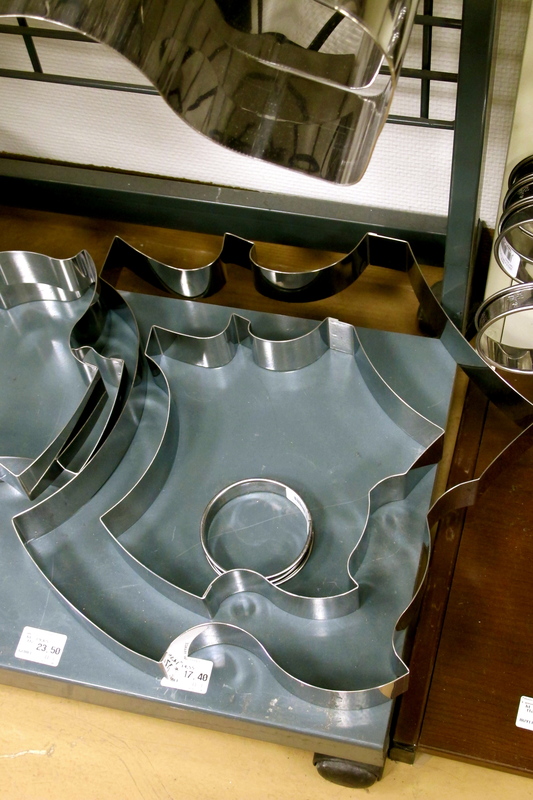 There are chocolate molds for everything occasion, industrial size ladles and spatulas and more knick knacks and gadgets then I could ever dream what to do with. 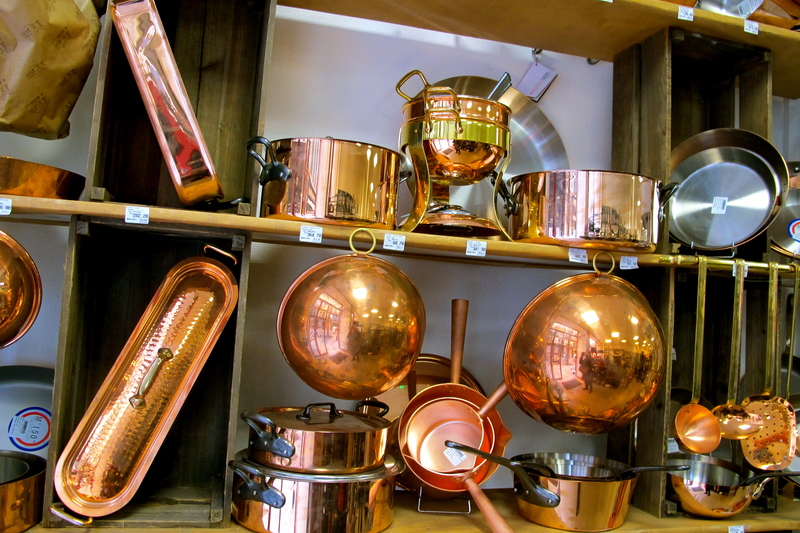 While walking through the kitchen supply stores, wishing I could own everything, I was reminded of the scene in Julie & Julia when Julia Childs walks through a kitchen store in Paris throwing everything she lays her hand onto into her basket. I cannot wait for the day when I can do the same!